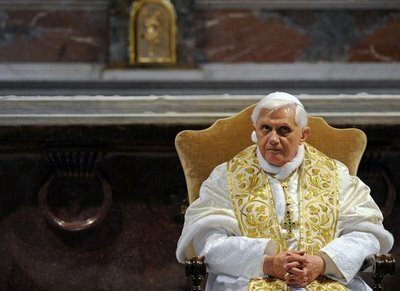 Today Pope Benedict XVI addressed the United Nations. Pope Benedict XVI's Mass at the Nationals Park in Washington, DC. Let us join with this parish in praying consistently for the Holy Father over the course of these next few days. Before leaving, I would like to pause to acknowledge the immense suffering endured by the people of God in the Archdiocese of New Orleans as a result of Hurricane Katrina, as well as their courage in the challenging work of rebuilding. I would like to present Archbishop Alfred Hughes with a chalice, which I hope will be accepted as a sign of my prayerful solidarity with the faithful of the Archdiocese, and my personal gratitude for the tireless devotion which he and Archbishops Philip Hannan and Francis Schulte showed toward the flock entrusted to their care. When I visited the cathedral of the Archdiocese of New Orleans and saw the Archbishop last January - where I received a third class relic of Blessed Basil Anthony Moreau - I was greatly impressed with the design of their Cathedral. Does anyone have a photo of this new chalice? 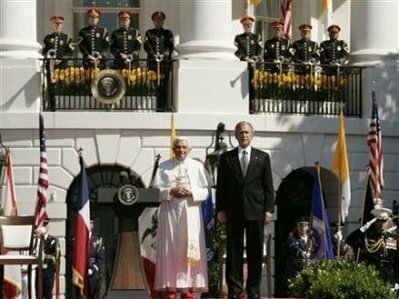 President Bush, on behalf of all Americans, welcomed the Holy Father, wished him a happy birthday, and thanked him for the spiritual and moral guidance, which he offers to the whole human family. The President wished the Pope every success in his Apostolic Journey and in his address at the United Nations, and expressed appreciation for the Pope’s upcoming visit to "Ground Zero" in New York. 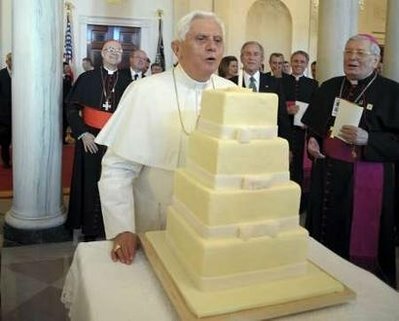 Happy 81st Birthday to the Holy Father!! Thank you for your gracious words of welcome on behalf of the people of the United States of America. I deeply appreciate your invitation to visit this great country. My visit coincides with an important moment in the life of the Catholic community in America: the celebration of the two-hundredth anniversary of the elevation of the country's first Diocese – Baltimore – to a metropolitan Archdiocese, and the establishment of the Sees of New York, Boston, Philadelphia and Louisville. Yet I am happy to be here as a guest of all Americans. I come as a friend, a preacher of the Gospel and one with great respect for this vast pluralistic society. America's Catholics have made, and continue to make, an excellent contribution to the life of their country. As I begin my visit, I trust that my presence will be a source of renewal and hope for the Church in the United States, and strengthen the resolve of Catholics to contribute ever more responsibly to the life of this nation, of which they are proud to be citizens. From the dawn of the Republic, America's quest for freedom has been guided by the conviction that the principles governing political and social life are intimately linked to a moral order based on the dominion of God the Creator. The framers of this nation's founding documents drew upon this conviction when they proclaimed the "self-evident truth" that all men are created equal and endowed with inalienable rights grounded in the laws of nature and of nature's God. The course of American history demonstrates the difficulties, the struggles, and the great intellectual and moral resolve which were demanded to shape a society which faithfully embodied these noble principles. In that process, which forged the soul of the nation, religious beliefs were a constant inspiration and driving force, as for example in the struggle against slavery and in the civil rights movement. In our time too, particularly in moments of crisis, Americans continue to find their strength in a commitment to this patrimony of shared ideals and aspirations. In the next few days, I look forward to meeting not only with America's Catholic community, but with other Christian communities and representatives of the many religious traditions present in this country. Historically, not only Catholics, but all believers have found here the freedom to worship God in accordance with the dictates of their conscience, while at the same time being accepted as part of a commonwealth in which each individual and group can make its voice heard. As the nation faces the increasingly complex political and ethical issues of our time, I am confident that the American people will find in their religious beliefs a precious source of insight and an inspiration to pursue reasoned, responsible and respectful dialogue in the effort to build a more humane and free society. Freedom is not only a gift, but also a summons to personal responsibility. Americans know this from experience – almost every town in this country has its monuments honoring those who sacrificed their lives in defense of freedom, both at home and abroad. The preservation of freedom calls for the cultivation of virtue, self-discipline, sacrifice for the common good and a sense of responsibility towards the less fortunate. It also demands the courage to engage in civic life and to bring one's deepest beliefs and values to reasoned public debate. In a word, freedom is ever new. It is a challenge held out to each generation, and it must constantly be won over for the cause of good (cf. Spe Salvi, 24). Few have understood this as clearly as the late Pope John Paul II. In reflecting on the spiritual victory of freedom over totalitarianism in his native Poland and in eastern Europe, he reminded us that history shows, time and again, that "in a world without truth, freedom loses its foundation", and a democracy without values can lose its very soul (cf. Centesimus Annus, 46). 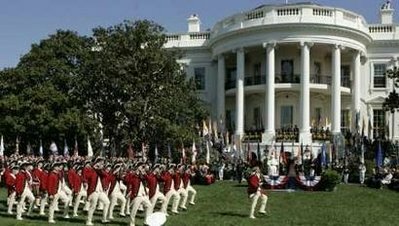 Those prophetic words in some sense echo the conviction of President Washington, expressed in his Farewell Address, that religion and morality represent "indispensable supports" of political prosperity. For well over a century, the United States of America has played an important role in the international community. On Friday, God willing, I will have the honor of addressing the United Nations Organization, where I hope to encourage the efforts under way to make that institution an ever more effective voice for the legitimate aspirations of all the world's peoples. On this, the sixtieth anniversary of the Universal Declaration of Human Rights, the need for global solidarity is as urgent as ever, if all people are to live in a way worthy of their dignity – as brothers and sisters dwelling in the same house and around that table which God's bounty has set for all his children. America has traditionally shown herself generous in meeting immediate human needs, fostering development and offering relief to the victims of natural catastrophes. I am confident that this concern for the greater human family will continue to find expression in support for the patient efforts of international diplomacy to resolve conflicts and promote progress. In this way, coming generations will be able to live in a world where truth, freedom and justice can flourish – a world where the God-given dignity and rights of every man, woman and child are cherished, protected and effectively advanced. 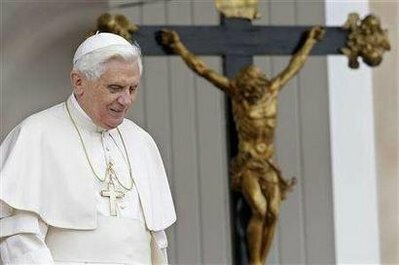 CBS News will offer comprehensive coverage of Pope Benedict XVI's visit to the United States from his arrival in Washington, D.C., on Tuesday (15), through his departure from New York City on Sunday (20). 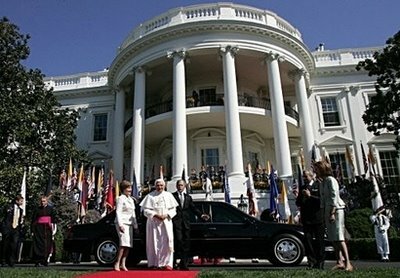 CBS News' coverage will include carrying the Pontiff's arrival at the White House on Wednesday (16) live, along with reports on the CBS EVENING NEWS WITH KATIE COURIC (6:30-7:00 PM, ET/PT) and THE EARLY SHOW (7:00-9:00 AM, ET/PT). CBSNews.com and CBS Radio News will add to the coverage, providing live reports on public events during the Pope's trip. National Correspondent Byron Pitts will travel with the Pope through the duration of his U.S. visit and will report for the CBS EVENING NEWS on the state of the Catholic Church, the Pope's role in U.S. politics, religious tolerance and any breaking news regarding the Pontiff's daily activities. Tonight, Correspondent Bob Orr will report on preparations by U.S. law enforcement and Secret Service to protect the Pope as he moves throughout the Northeast, often in large open venues. Coverage on THE EARLY SHOW will include live reports and live West Coast updates of many of the historic events taking place during the Pope's visit. 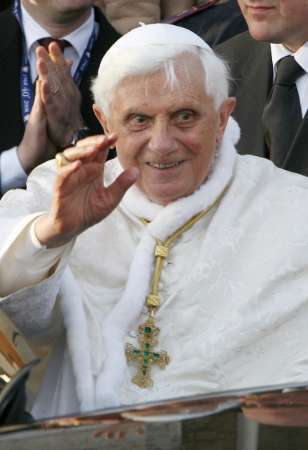 On Tuesday (15), correspondent Jeff Glor will be live from Andrews Air Force Base awaiting the arrival of Pope Benedict. On Wednesday (16), co-anchor Maggie Rodriguez will be live at the White House to cover the Pope's arrival ceremony with President Bush live for the West coast. On Thursday (17), Rodriguez will co-anchor from Nationals Park in Washington, D.C., before the Pope celebrates Mass there later in the day. Glor and Rodriguez will continue to cover the Pope's arrival in New York City for THE EARLY SHOW on Thursday, Friday and Saturday. CBSNews.com will provide live Webcast coverage of all public events during the Pope's visit and an online library of on-demand video clips from the trip and from Benedict's papacy as a whole. 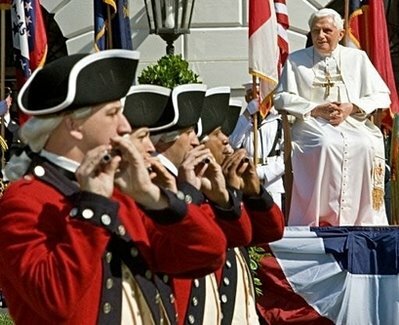 The site will also have a number of interactive elements, including a timeline of the Pope's itinerary in the U.S. and his life in pictures, his thoughts on major world issues and a timeline of milestones in his life, which can be viewed here: Pope Benedict in America . CBS Radio News will provide reports on the Papal trip, including those from National Correspondent Dan Raviv, White House Correspondent Peter Maer and Correspondents Cami McCormick and Steve Kathan. CBS News Radio plans to air live coverage and special reports of the major public events in the Pope's schedule. 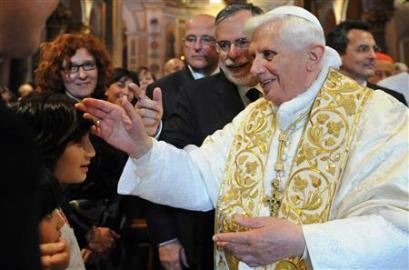 Coverage of Pope Benedict's arrival began with a SUNDAY MORNING piece on April 13 by Martha Teichner exploring how many U.S. citizens know who he is and how everyone from children to adults are preparing for the Pontiff's arrival, which can be seen here: Who Is Benedict XVI? . · Wednesday, April 16, 10:30 a.m.
· Wednesday, April 16, 5:30 p.m.
· Thursday, April 17, 10:00 a.m.
· Thursday, April 17, 5 p.m.
· Thursday, April 17, 6:30 p.m.
Buddhists, Muslims, Hindus, Jews and representatives of other religions will meet the Holy Father at the Pope John Paul II Cultural Center, next door to Catholic University. · Friday, April 18, 10:45 a.m.
· Friday, April 18, 6 p.m.
· Saturday, April 19, 9:15 a.m.
· Saturday, April 19, 4:30 p.m.
· Sunday, April 20, 9:30 a.m.
· Sunday, April 20, 2:30 p.m.
· Sunday, April 20, 8 p.m.
"The Church prays everyday to the Holy Spirit for the gift of vocations. Gathered around the Virgin Mary, Queen of the Apostles, as in the beginning, the ecclesial community learns from her how to implore the Lord for a flowering of new apostles, alive with the faith and love that are necessary for the mission." 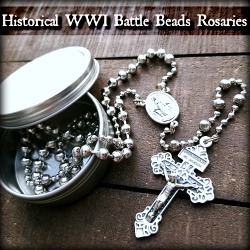 The Catholic Converts blog has been working on putting together a 24 Hour Rosary for Vocations. Based on the time in Vatican City it will begin at 6:00 PM tonight on the East Coast in the United States. We are asking people to sign up for as little as 30 minutes of praying the rosary with an intention for vocations. I encourage you to consider participating in this event and also ask that you consider helping spread the word by forwarding this message to others who you think might be interested. An excerpt from Wikipedia: The winter mozzetta and the Paschal mozzetta fell into disuse during the pontificate of John Paul II (1978-2005), but their use has been restored by Pope Benedict XVI. 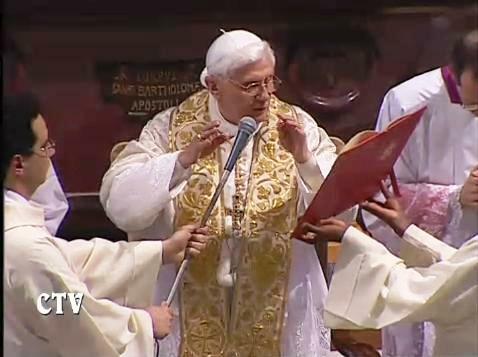 He wore the winter mozzetta during the papal station at the image of the Madonna near the Spanish Steps that traditionally marks the beginning of Rome's winter season, and he wears it on all the occasions in the winter season where this garment is appropriate. 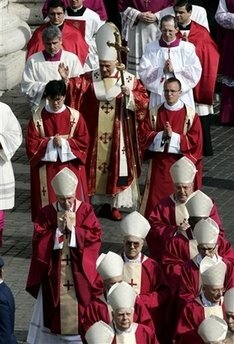 The white mozzetta was reintroduced during the Octave of Easter in 2008. This change between winter and summer garments is very practical, given the oppressive heat of the Roman summer. What do you do when 152 people show up for the inaugural Sunday Traditional Latin Mass and you can only seat 98 people? Father Gerard Saguto, FSSP had no thoughts of sending anyone home and in the true spirit of Summorum Pontificum said “stack’em in”. They were able to fit another 13 seats in the packed day chapel and the remaining 41 people stood and sat in the narthex outside the entrance door. Of course, the Hamilton County Fire Marshall has now issued an arrest warrant for Father Saguto. 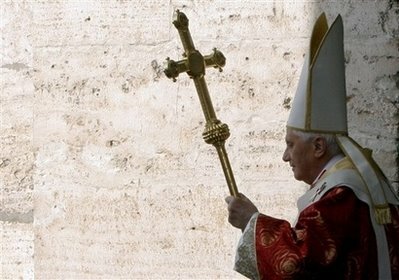 to Bring You His Word of Life"
VATICAN CITY, APRIL 8, 2008 (Zenit.org).- Here is the text of the video-message that Benedict XVI sent to the people of the United States on the occasion of his imminent visit to Washington, D.C., and New York. His visit will take place April 15-20. Together with your Bishops, I have chosen as the theme of my journey three simple but essential words: "Christ our hope". Following in the footsteps of my venerable predecessors, Paul VI and John Paul II, I shall come to United States of America as Pope for the first time, to proclaim this great truth: Jesus Christ is hope for men and women of every language, race, culture and social condition. Yes, Christ is the face of God present among us. Through him, our lives reach fullness, and together, both as individuals and peoples, we can become a family united by fraternal love, according to the eternal plan of God the Father. I know how deeply rooted this Gospel message is in your country. I am coming to share it with you, in a series of celebrations and gatherings. I shall also bring the message of Christian hope to the great Assembly of the United Nations, to the representatives of all the peoples of the world. Indeed, the world has greater need of hope than ever: hope for peace, for justice, and for freedom, but this hope can never be fulfilled without obedience to the law of God, which Christ brought to fulfillment in the commandment to love one another. Do to others as you would have them do to you, and avoid doing what you would not want them to do. This "golden rule" is given in the Bible, but it is valid for all people, including non-believers. It is the law written on the human heart; on this we can all agree, so that when we come to address other matters we can do so in a positive and constructive manner for the entire human community. I direct a cordial greeting to Spanish-speaking Catholics and manifest my spiritual closeness, in particular to the youth, the ill, the elderly and those who are in moments of difficulty of feel themselves in need. I express my heartfelt desire to be with you soon in this beloved nation. In the meantime, I encourage you to pray intensely for the pastoral fruits of my imminent apostolic trip and to keep high the flame of hope in the resurrected Christ. My comments follow in green. CHICAGO, January 18, 2007 (LifeSiteNews.com) – Catholic priest Father Michael Pfleger of the Archdiocese of Chicago wants people to know that pro-abortion, pro-homosexual marriage Senator Barack Obama "is the best thing to come across the political scene since Bobby Kennedy." Father Pfleger says he has known Obama for 20 years. "I think Barack Obama is in a class of his own," he said. In 2006, Obama cast his vote against the Federal Marriage Amendment. "Personally, I do believe that marriage is between a man and a woman," he said the day he voted against defining marriage as between a man and a woman. But Father Pfleger is just concerned for Obama's "vulnerability." "When anybody comes with that much hope, whether it's a Bobby Kennedy or whether it's a Martin Luther King Jr., they do become vulnerable. They become vulnerable because they tell the country and the world that we can be better and we don't have to accept what is. And unfortunately, we live in a world where not everybody wants it to be different." Although Father Pfleger says he is pro-life, he has a long history of inviting outspoken pro-abortion advocates into his pulpit – this despite the fact that the Chicago Archdiocese has a longstanding policy explicitly forbidding the use of Church property, under any circumstances, by pro-abortion advocates. Pfleger has also hosted Muslim firebrand Louis Farrakhan, a known ridiculer of the Pope who has condemned Judaism as "a gutter religion." Nor is this the first time Father Pfleger has been outspoken in his support of pro-abortion politicians. In February 2003 he invited pro-abortion Presidential candidate and Pentecostal minister Rev. Al Sharpton to speak during Mass. For Sharpton, that was the first time he had spoken in a Catholic church. "The comfort," he told the Chicago Sun-Times after the event, "is that Father Pfleger is a different kind of a Catholic priest." The earth is full of the goodness of the Lord, alleluia: by the word of the Lord were the heavens made, alleluia, alleluia. -- (Ps. 32. 1). Rejoice in the Lord, O ye righteous: praise is comely for the upright. V.: Glory to the Father . . . -- The earth is full of the goodness of the Lord . . . COLLECT -O God, who, by the humility of Thy Son, didst lift up a fallen world, grant unending happiness to Thy faithful: that those whom Thou hast snatched from the perils of endless death, Thou mayest cause to rejoice in everlasting days. Through our Lord Jesus Christ, Thy Son, who liveth and reigneth . . .
Luke 24: 35Alleluia, alleluia. V.: The disciples knew the Lord Jesus in the breaking of bread. Alleluia. V.: (John 10. 14). I am the good Shepherd: and I know My sheep, and Mine know Me. Alleluia. Psalms 62: 2, 5O God, my God, to Thee do I watch at break of day: and in Thy Name I will lift up my hands, alleluia. 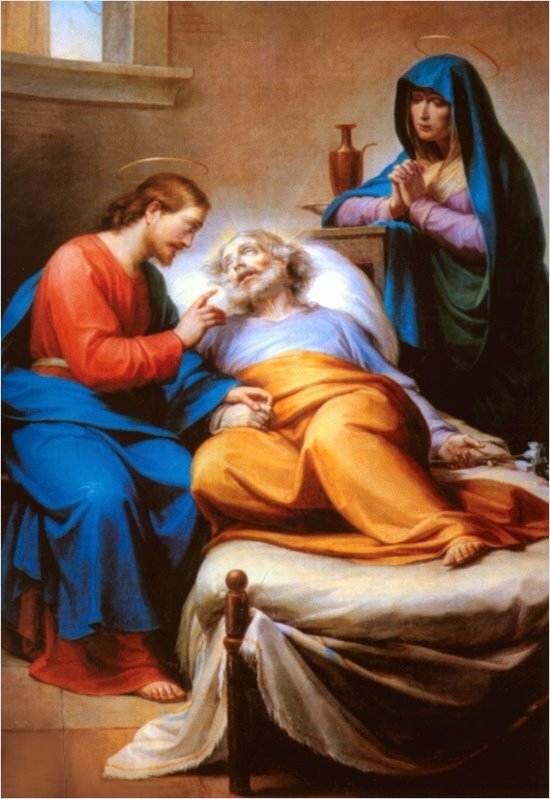 SECRET - May this holy offering, O Lord, always bring to us Thy healing blessing: that what it represents in a Mystery, it may accomplish with power. Through our Lord Jesus Christ, Thy Son, who liveth and reigneth . . .
POST COMMUNION - Grant unto us, we beseech Thee, almighty God, that having received the grace of a new life, we may ever glory in Thy gift. Through our Lord Jesus Christ, Thy Son, who liveth and reigneth . . . The date of April 2 has been imprinted in the Church's memory as the day the Servant of God Pope John Paul II [said] good-bye to this world. 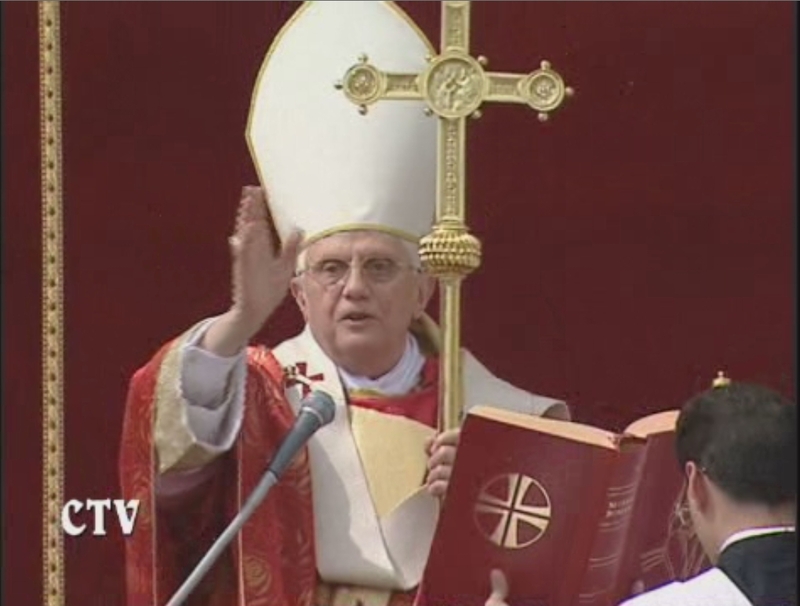 Let us again live with emotion the hours of that Saturday afternoon, when the news of his passing away was received by a great multitude of people in prayer who filled St. Peter's Square. For a few days, the Vatican Basilica and this Square truly became the heart of the world. An uninterrupted river of pilgrims paid homage to the remains of the venerated Pontiff and his funeral was a last testament of the esteem and the affection that he had won in the spirit of so many believers and people from all the corners of the earth. Just like three years ago, today as well, just a short time has passed since Easter. The heart of the Church finds itself still submerged in the mystery of the resurrection of the Lord. In truth, we can interpret the entire life of my beloved predecessor, particularly his Petrine ministry, according to the sign of Christ resurrected. He felt an extraordinary faith in Him, and with Him, he maintained an intimate, unique, uninterrupted conversation. Among his many human and supernatural qualities, he had an exceptional spiritual and mystical sensitivity. It was enough to see him praying: He literally submerged himself in God and it seemed that everything else during those moments was left outside. 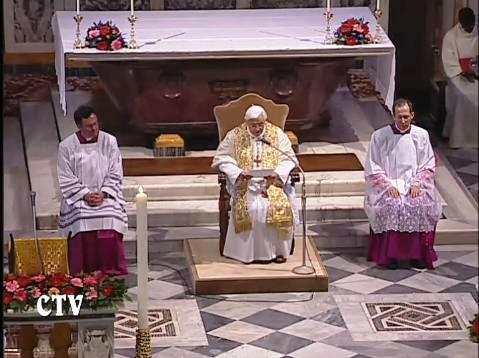 During the liturgical celebrations, he was attentive to the mystery being carried out, with a keen capacity to perceive the eloquence of God's word in the development of history, penetrating deeply into God's plan. 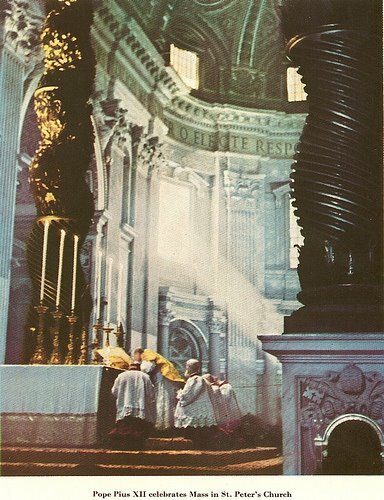 Holy Mass, as he often repeated, was for him the center of the day and all his existence -- the "living and holy" reality of the Eucharist that gave him spiritual energy to guide the people of God on the path of history. His pontificate, taken together and in many specific moments, presents itself to us as a sign and testimony of the resurrection of Christ. This paschal dynamism, which made of John Paul II's existence a total responding to the call of the Lord, could not be expressed except without a participation in the sufferings and the death of the divine Master and Redeemer. "This saying is trustworthy," the Apostle Paul says, "If we have died with him we shall also live with him; if we persevere we shall also reign with him" (2 Timothy 2:11-12). Since childhood, Karol Wojtyla had experienced the truth of these words, finding the cross on his path, in his family, with his people. 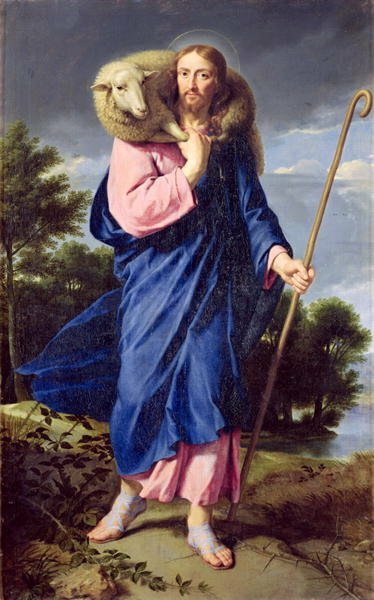 Very soon he decided to carry it beside Jesus, following in his footsteps. He wanted to be his faithful servant to the point of welcoming the call to the priesthood as a gift and a commitment for all of his life. With Him, he lived, and with Him, he wanted to die. And all of this by way of the unique mediation of most holy Mary, mother of the Church, mother of the Redeemer, intimately and truly associated with the salvific mystery of his death and resurrection. In this evocative reflection, the biblical readings just proclaimed guide us: "Be not afraid!" (Matthew 28:5). The words of the angel of the Resurrection, addressed to the women before the empty tomb, which we just heard, became a type of motto on the lips of Pope John Paul II, since the solemn beginnings of his Petrine ministry. He repeated them on various occasions to the Church and to the world on the journey toward the year 2000, and after having passed that historical time, as well as afterward, in the dawn of the third millennium. He always pronounced them with inflexible firmness, first raising up [his] crosier predominated by the cross, and later, when his physical energies were weakening, nearly clinging to it, until that last Good Friday, in which he participated in the Way of the Cross from his private chapel, embracing within his arms the cross. We cannot forget that last and silent testimony of love for Jesus. That eloquent scene of human suffering and faith, in that last Good Friday, also indicated to believers and to the world the secret of every Christian life. That "be not afraid" was not based on human strength, nor on successes accomplished, but rather, only on the word of God, on the cross and resurrection of Christ. In the degree in which he was being stripped of everything, at the end, even of his very words, this total surrender to Christ manifested itself with increasing clarity. As it happened to Jesus, also in the case of John Paul II, words gave way at the end to the ultimate sacrifice, to the gift of self. And death was the seal of an existence totally given to Christ, conformed to him even physically with the traits of suffering and trusting abandonment to the arms of the heavenly Father. "Let me go to the house of the Father," these words -- report those who were at his side -- were his last words, the fulfillment of a life totally oriented to knowing and contemplating the face of the Lord. 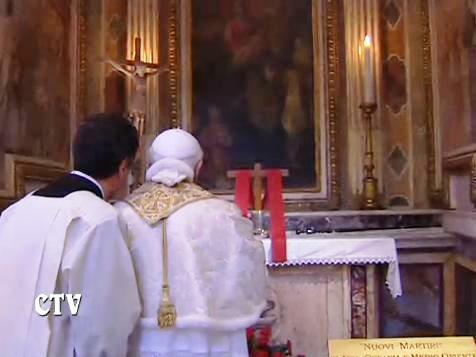 For this reason, he wanted to elevate to the altars Sister Faustina Kowalska, a humble religious converted by the mysterious divine design into the prophetic messenger of divine mercy. The Servant of God John Paul II had known and personally lived the terrible tragedies of the 20th century, and he asked himself during a long time what could stop the advance of evil. The answer could only be found in the love of God. Only divine mercy, in fact, is capable of putting limits on evil; only the omnipotent love of God can topple the dominance of the evil ones and the destructive power of egotism and hate. For this reason, during his last visit to Poland, upon returning to his native land, he said, "Apart from the mercy of God there is no other source of hope for mankind." Let us give thanks to God because he has given the Church this faithful and courageous servant. Let us praise and bless the Virgin Mary for having ceaselessly watched over his person and his ministry for the benefit of the Christian people and all of humanity. And while we are offering for his chosen soul the redeeming Sacrifice, we ask him to continue interceding from heaven for each one of us, for me in a special way, who Providence has called to take up his inestimable spiritual heritage. May the Church, following his teaching and example, faithfully continue its evangelizing mission without compromises, spreading tirelessly the merciful love of Christ, fount of true peace for the entire world. 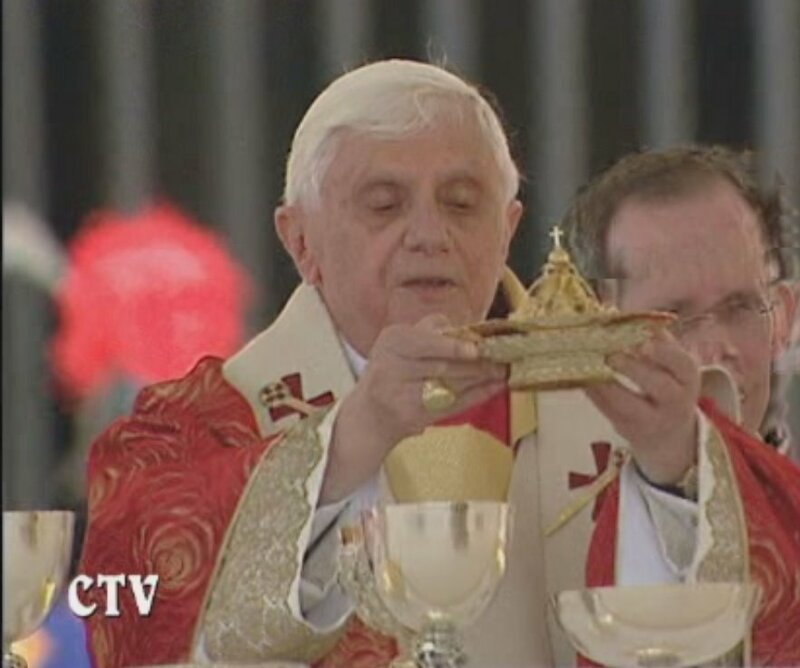 Notice in the above image Pope Benedict XVI is using a papal asteriscus, an item that, in addition to practical applications, symbolizes the Star of Bethlehem. For more information on this rarely used liturgical item, visit The New Liturgical Movement. 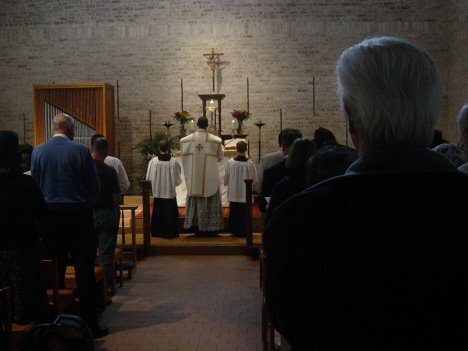 If you have photos of any Mass celebrated for the Triduum of this year being according to the 1962 Missal, I would like to post them on this blog. If you have any such photos, please email them to me. My email address is available on my profile. I wish to thank Joie for sending me the following comment. 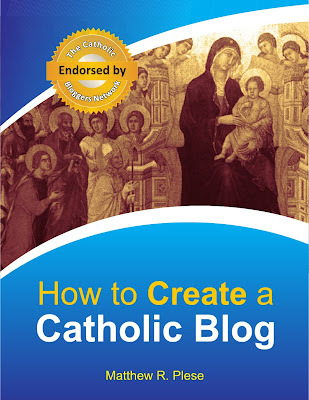 Comments like these emphasize that the desire for Traditional Catholicism strongly exists in Catholics of all ages. 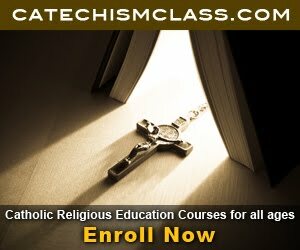 Traditional Catholicism is growing and thankfully, the only Catholics that continue to have large families are traditional Catholics. Hello I am also a catholic that believes in what you feel. I am not a religious but do believe that the Catholics of today need tradition more than ever. The kids as well need to know a church of what it was and not what it is. Religious life is a gift and wearing a habit is a commitment and shows the world there are those that carry faith for all. I have an aunt who is a sister in an order that still wears a habit The Apostles Of the Sacred Heart Of Jesus. They have the choice of wearing either the long habit or a shorter habit. Though many wear the shorter I still believe in the long because of the respect I think it serves to a testimony of faith and sacrifice. I only wish my calling would have been stronger so I could have carried out that faith years ago. 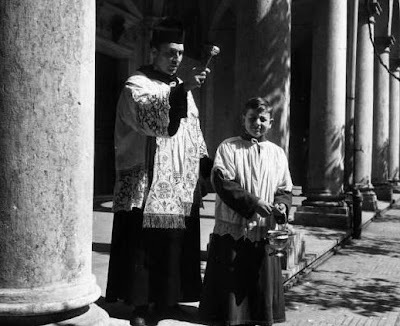 I always seeked help with the vocation but many of the priests here in Saint Louis only never paid any attention to my calling when I was younger I am now 45 and still love my faith in my own way. many prayers to those religious young and older who still believe that a habit is a beautiful statement of faith. Thank you. The following was sent to me by email. 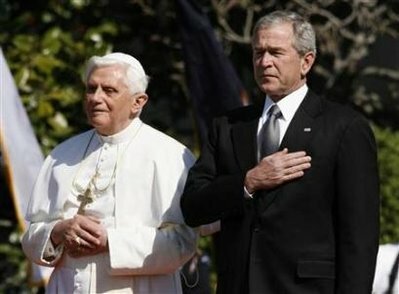 I would like to pass it along, in honor of the Holy Father's upcoming trip to the United States. Thanks, God Bless and have a great Easter Season. He is Risen indeed! For those who prefer to follow the 1962 Calendar of Saints, today is the 1st Class Feast of St. Joseph, Spouse of the Blessed Virgin Mary. While normally celebrated on March 19, it is moved this year due to a conflict with Holy Week. The Novus Ordo Calendar celebrated his feast on March 15, under a newer rule which moves his feast forward rather than later in the calendar.